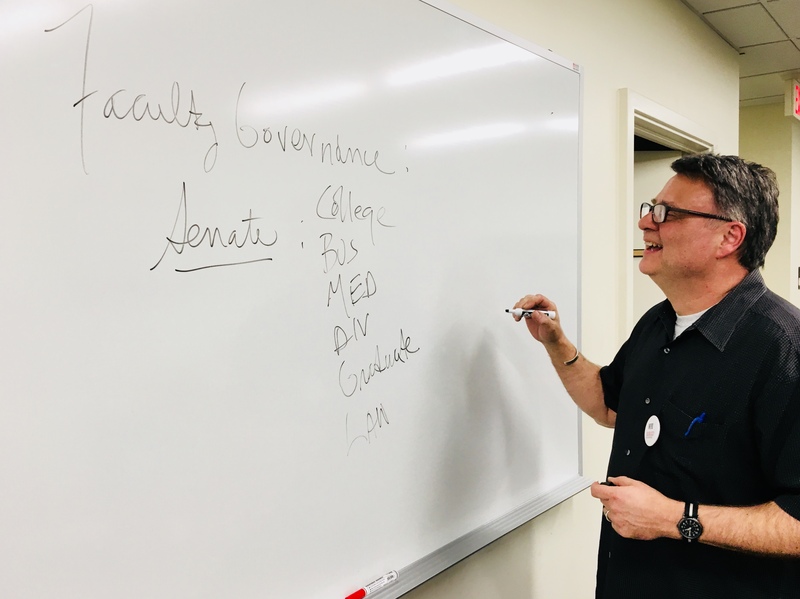 WFU AAUP is following up on the motions passed in the College Faculty and Senate last year to raise faculty salaries at all ranks, but especially among the ranks of Associate, Assistant and Teaching Professors. Faculty Members at WFU largely perceive that they are being underpaid, and the data bear that out. According to the Office of Institutional Research, in the College and Graduate School of A&S only, the number of “Instructors,” a category that includes Teaching Professionals, Professors of the Practice and Visiting Faculty, grew from 115 in 2017-18 to 136 in 2018-19. The mean Instructor salary was $62,195 in 2017-18 and $61,128 in 2018-19. The mean salary of the 95 faculty who continued in their position in both years was $63,603 in 2017-18 and $65,621 in 2018-19, an increase of 3.20%. The inflation rate from July 2017 to July 2018 was 2.95%, virtually negating any salary increase for those continuing faculty. The WFU AAUP Faculty Financial Situation and Morale Survey, which polled 556 College faculty members (392 of whom responded, a 71% response rate), revealed that two out of three survey respondents teach Summer School out of economic need. Student debt levels among incoming faculty — especially Teaching Professors and Assistant Professors — have increased substantially in recent years. Nearly 60% found that their monthly pay increases lagged behind their monthly repayment obligations. According to the data in WFU Salary Growth Relative to Tuition Increases, a table available at wfuaaup.org, from 2002-2018 the cumulative percentage difference between increases in the faculty salary pool and increases in undergraduate tuition and fees is 23.3%. If salary increases had tracked tuition increases, salaries would be 23.3% higher than they are now. Join WFU AAUP in seeking a commitment from the administration to raise the salary pool significantly and allocate it equitably among the faculty. There is strength in numbers. Sources: American Association of University Professors, Faculty Compensation Survey (Mar.-Apr. 2018); Office of Institutional Research. The nine comparison institutions are: Davidson, Duke, Emory, Richmond, UNC-CH, UVA, Vanderbilt, Washington and Lee, and William and Mary. The WFU AAUP sent the survey to 556 faculty teaching in any fulltime capacity in Wake Forest College. The survey was open to responses from December 5 to December 13, 2018. Of the 556 faculty members polled, 392 responded. The high response rate reveals that the faculty feels strongly about these issues. Members largely perceive that they are being underpaid, and the data bear that out. The survey also reveals that student debt is a considerable burden for many faculty members, especially among the lowest salary ranks, assistant professors and assistant and associate teaching professors. In addition, the survey indicates that two out of three respondents teach Summer School out of economic need. When asked, “Overall, I am quite satisfied with my salary increases over the last five years,” just 20% strongly agreed or agreed, the rest were neutral or disagreed or strongly disagreed. In the only category that stands out, Associate Professors are 5.7 times more likely to teach Summer School out of need than Full Professors. 73% found their monthly student loan repayments heavy (38%) or moderate (35%), with 27% finding them light. Nearly 60% found that their monthly pay increases lagged behind their monthly repayment obligations. 47% of respondents had no knowledge that full-time faculty are eligible for the Public Service Loan Forgiveness program. Wake Forest’s benefits package receives a 50% approval rating. 32% said they are satisfied about the level of their participation in governance in the College. 64% are satisfied with their input in their departments. The survey has a margin for error of +/- 3 percentage points at the 95% confidence level. The margin for error score is very good for the validity of this survey; we can be confident at the 95% level that when we say, for example, that just 20% of faculty are satisfied with their salary increases over the last five years, that 20% score means that for all faculty somewhere between just 17% or 23% are satisfied. In other words, somewhere from 77% to 83% of college faculty are not satisfied. It should be noted that the fate of this program, signed into law by the Bush administration in 2007, is currently in question. Under the Trump administration, less than 1% of the first applications for debt cancellation (after ten years of repayment) have been accepted. See “Why are people being denied public service loan forgiveness?,” The Washington Post, 12.21.2018. Welcome to the website of the Wake Forest Chapter of the American Association of University Professors (WFU AAUP), a place to find information and perspectives on the rights and responsibilities of faculty and news about the status of the profession, among other things. There is plenty to do and your participation is crucial. Please bring your concerns to the meetings or send them to aaup.wfu@gmail.com. Steve Boyd, WFU AAUP President; Easley Professor for the Study of Religion. Interested in being part of the AAUP? Join the national organization through their website by clicking the button below.